Due to the 2016 exhaust emission rules in Japan, many models went out of production in September 2017. 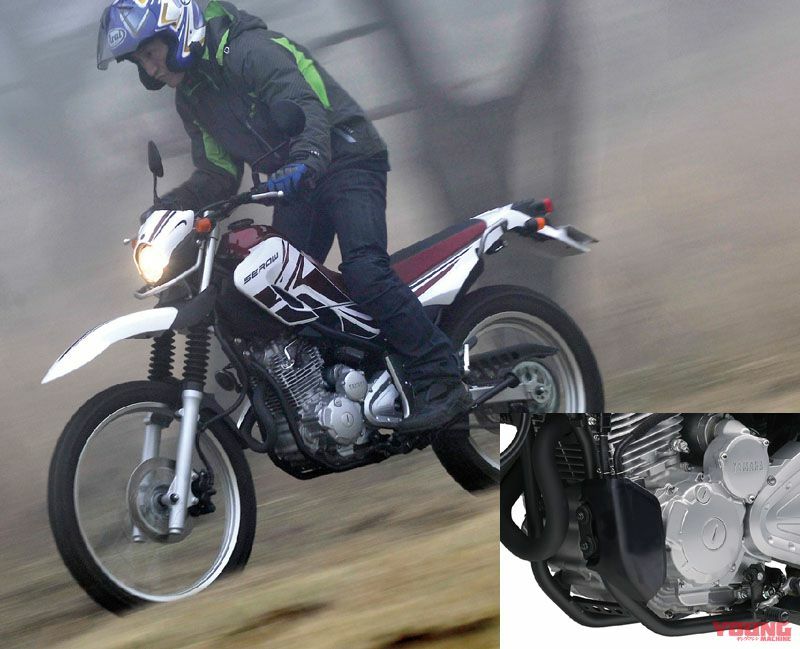 One of those, the Yamaha Serow 250, has managed to stage a revival after a year out of production. So, we would like to share the details about it here. 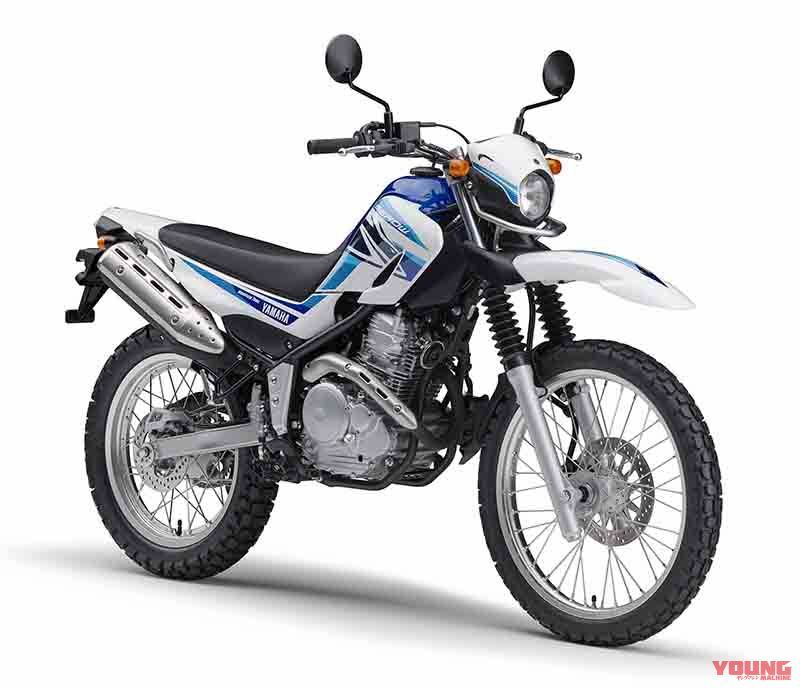 On 25th July 2018, Yamaha formally announced the new Serow 250 will go on sale on 31st August. At the time when the bike was declared out of production in September 2017, Yamaha themselves Tweeted about the possibility of a revival at a later date. Well, this can now be regarded as a certainty because its revival has finally become a reality. 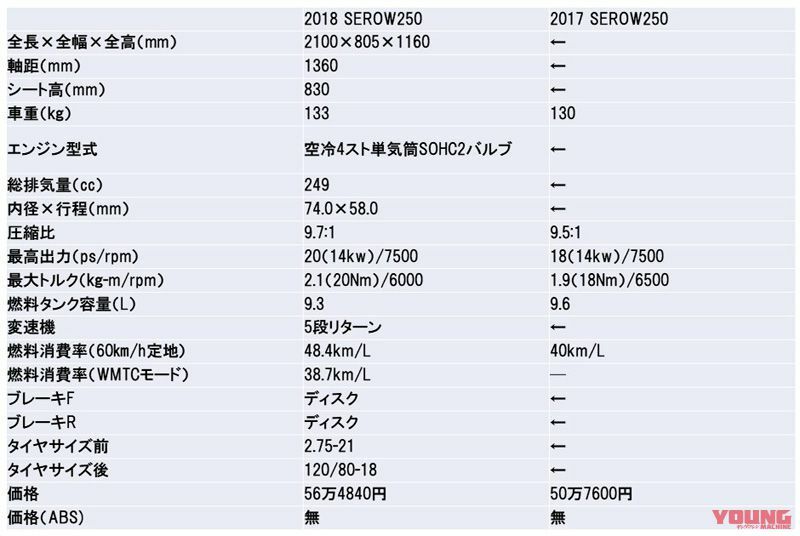 As you can see in the picture at the top of the page, the Serow 250 hasn’t changed much compared with the previous model. The characteristics of the traditional model that continued from 1985 have been retained, and the 2016 exhaust emission rules have been met. Along with 02 feedback control FI (fuel injection), it is also fitted with a canister to the frame that reduces gas evaporating and getting to the outside air. Also, the rear fender and tail light have been remodelled. In terms of spec the bike weight has increased by 3kg. On the other hand, fuel consumption has improved from 40km/litre to 48.4km/litre. Maximum power output is the same at 14kw, but it bhp terms has gone up from 18 to 20. Other than this, maximum torque has increased from 18nm (1.9kg-m)/6500rpm to 20nm (2.1kg-m)/6000rpm, which seems to have been achieved from a rise in compression ratio from 9.5 to 9.7. Colour variations include the continuation of the white/green, and white/orange with some detail changes, and the beige colour has been discontinued in favour of a new white/blue scheme. The price has been increased by around $500, making a total price of approx $5080. 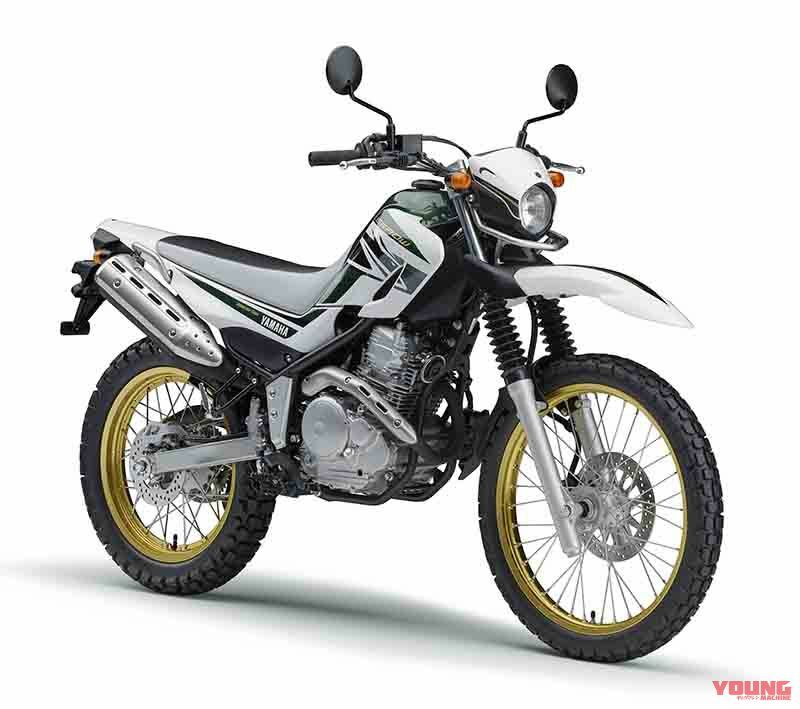 (YAMAHA Serow 250 2018 Japan spec model. Price: $5080. Date of release: August 31st) Purplish-white solid 1 (white/blue) colour scheme shares the same graphics as the previous model. 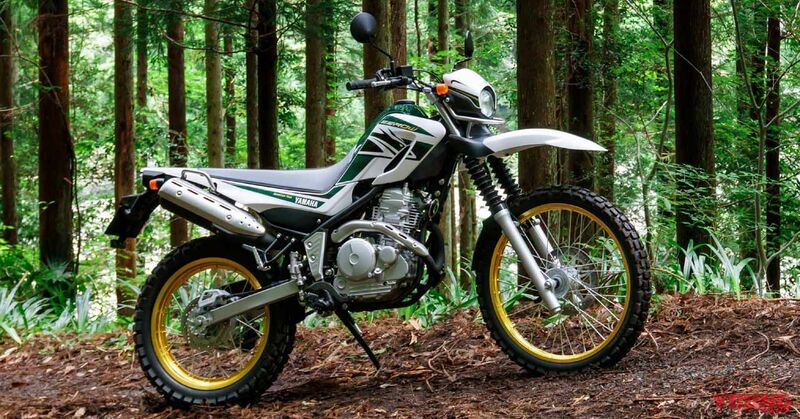 (YAMAHA Serow 250 2018 Japan spec model. Price: $5080. Date of release: August 31st) Purplish-white solid 1 (white/green) colour scheme shares the same graphics as the previous model, but the insert colour and area around the side of the seat is different. 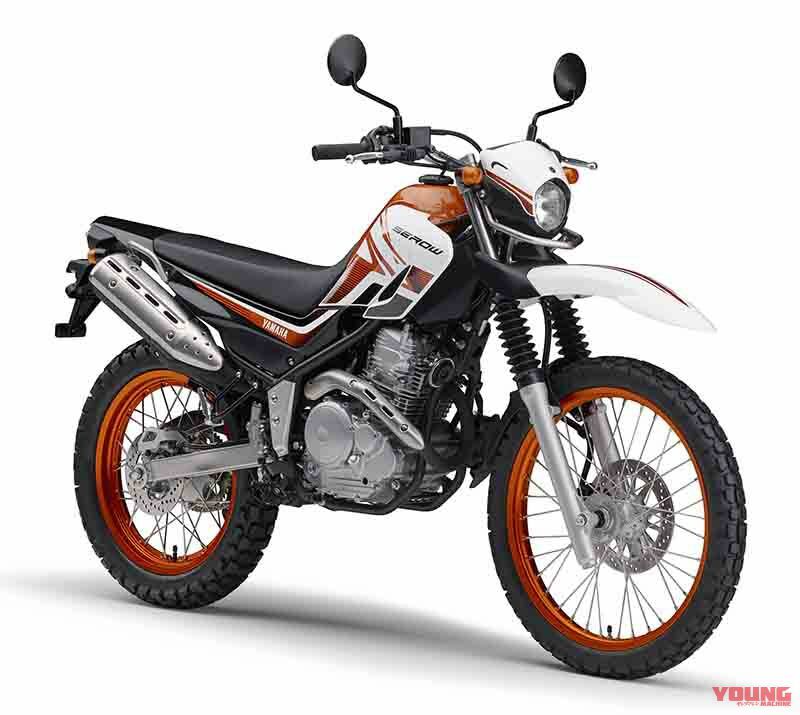 (YAMAHA Serow 250 2018 Japan spec model. Price: $5080. Date of release: August 31st) Purplish-white solid 1 (white/orange) colour scheme graphics are new, the rear fender gets a different colour in black, and there are other differences in colour variations. 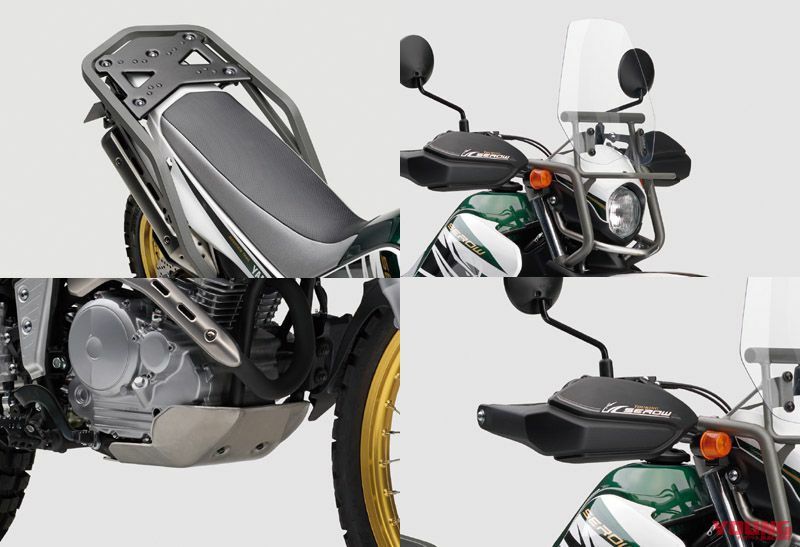 The bike running in the main picture here is the previous model, and the bottom right picture shows the newly equipped canister section on the 2018 Serow 250. The 2016 gas emission rules also regulate the evaporation rate of fuel, so it has become essential for a canister to be fitted in order to keep this level down. Along with this, the tank capacity has been lessened by 300ml. 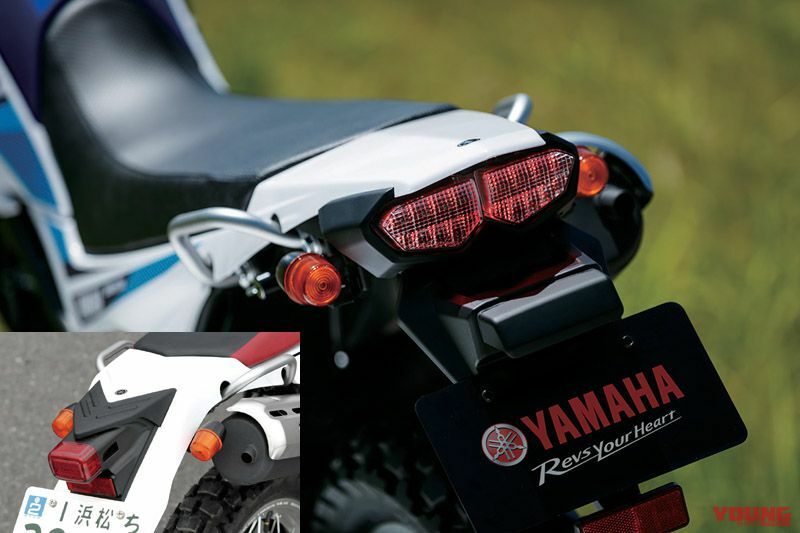 The new 2018 Serow 250 adopts an LED tail light, and the bottom left picture shows the previous version. This is the same fitting as the XT250X motard, and comes as a set with a rear fender that rises up. The picture shows the tail area with the lights in operation. Yamaha Motor Company have also announced that an accessory package (Touring Serow) to suit touring will be made available for the new Serow 250, and is due for release on 13th September with a new price. It will be equipped with the same adventure screen, handle guards, adventure rear carriers and aluminium under-guard as the previous model. Out of these four items, the screen, handle guards and rear carriers are exclusive development parts, and those responsible for taking charge of the design are GK Dynamics. The finish does not harm the bike’s image, and is gaining popularity. (Touring Serow 2018 model Price:$5575 Date of release:13th September) It seems that quite a high proportion of customers choose the Touring Serow spec when purchasing a Serow. The price has gone up by about $550 from the previous model. (upper right) The adventure screen is approx $210. Size is 300mmx300mm. (lower right) Handle guards are approx $125. Made of polyamide. (upper left) Adventure rear carrier approx $275. Made of aluminium. Price has gone up around $50 from the previous model. (lower left) Aluminium under-cover is approx $175. Total sum of all parts comes to approx $785. All of this is handled by Y’s Gear company.